Legends Romona Keveza Fall 2018 was unveiled at New York Bridal Fashion Week. 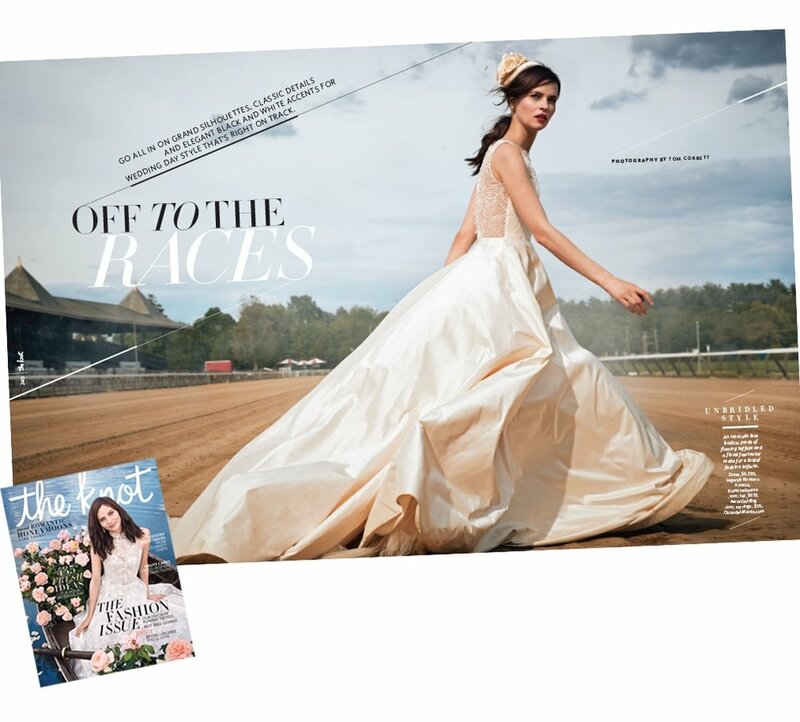 Legends Romona Keveza Spring 2018 featured in the Fall Issue of The Knot Magazine. Be Your Own Legend. Be a Legend in Your Own Time. Legends Romona Keveza's Real Bride Aisllinn Diaz's Malibu wedding featured in the Spring 2017 Issue of Martha Stewart Weddings. Click here to view full wedding gallery. Watch Aislinn and Eric's wedding film by Cloudless Weddings. Aislinn Diaz and Eric Vera's wedding guests were in suspense. Following the couple's August 7, 2016, Catholic ceremony at the historic Mission San Fernando Rey de España, in Los Angeles, their friends and family were in instructed to head back to their hotel. From there, they would be driven to the undisclosed reception location. "Except for our parents, no one knew where they were headed," says Aislinn, a postbaccalaureate student. As the shuttles made the drive up the Malibu hills, everyone got their first glimpse of Malibu Rocky Oaks Estate Vineyards, an Italian-style estate and winery with stunning vistas of the Santa Monica Mountains. After cocktail hour, when margaritas and blueberry mojitos (named for the bride and groom) were served, guests were escorted to another part of the estate, where a velvet rope was lifted to reveal Aislinn and Eric on the property's helicopter pad, ready for their first dance. They actually used two songs: "All of Me," by John Legend (which Eric, a lawyer, had hired a string quartet to play when he proposed eight months earlier during a visit to UCLA, where they'd first met in 2009), and "Colgando en Tus Manos," by Carlos Baute featuring Marta Sánchez (a nod to their Mexican heritage). The couple joined 57 guests as they sat down to dinner around the estate's infinity pool. Tables were laden with flowers that included the bride's favorite color—pink—and antique-style place settings inspired by the old-world elegance of Italy, Spain, and France, their honeymoon destinations. After the cake-cutting, glasses of champagne were passed and toasts were made. For Aislinn, one of the most memorable was given by the couple's godmother, who asked that they turn to face their friends and family as she spoke. "The whole day we had been running around, but in that moment we were able to stop and take in all the love," she says. During the speeches, their fathers had planned a surprise of their own. "In Mexican soccer, we support rival clubs," says Eric. "So we had to put on each other's jerseys." As Aislinn donned the shirt of Chivas and Eric that of Club América, everyone cheered the joining of two people who were now, officially, a team.
" I put it on and I couldn't stop crying. I'm not a very emotional person. But it was this cry I couldn't hold in — I just loved it so much. I think that's how I knew it was the one. It's a beautiful, fitted mermaid wedding dress from Romona Keveza and it has layers of ivory and white, so it feels warm, romantic and very feminine. "